Janelle Tipton and Will Crown hold one of the blankets he helped make for patients at the UTMC Cancer Center. Battling cancer can leave one feeling cold, both physically when undergoing chemotherapy in a chilly infusion suite, and emotionally. A number of cancer patients at UT Medical Center, though, recently received gifts designed to soften the experience by warming the body and heart. 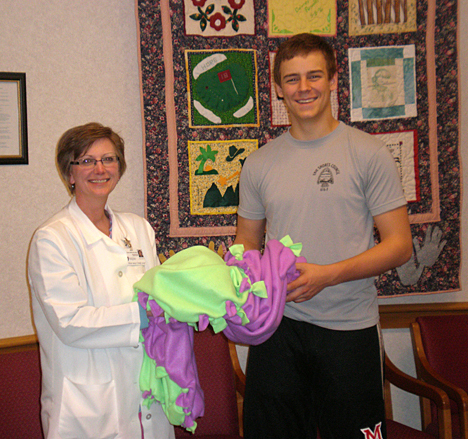 Will Crown, an 18-year-old graduate of St. Francis DeSales High School and Boy Scout, organized an effort to make about 25 chemotherapy blankets that were wrapped around nondenominational prayers and donated to the UTMC Cancer Center in mid-April. The blankets were gifted to cancer patients there for use at the facility and at home. Crown developed a budget, enlisted about a dozen volunteers from his high school as well as the Christ Presbyterian Church in Toledo, where he is a member, and his local Boy Scouts troop, and acquired donated material to make the blankets. Each blanket was made by a two-person team and took about 45 minutes to finish. Two different colors of fabric were used for each, making for a colorful wrap. The handmade nature of the blankets made them especially meaningful, she said. Crown’s mother, Karen, works in health and hearing about her experiences with cancer patients is what inspired him. “I heard about how their bodies are in a weakened state and get cold sometimes during chemotherapy, so the blankets seemed like a good way to offer emotional and physical comfort,” he said. He selected the UTMC Cancer Center as the distribution location to impact his immediate community. This endeavor was Crown’s Eagle Scout project. The venture was approved by his local Boy Scout troop and the American Cancer Society. Janelle Tipton, an oncology clinical nurse specialist at UTMC, helped coordinate the effort between Crown and the cancer society because the organization needed to approve the project for him to proceed. She also aided in identifying patient recipients of the blankets and in distribution. This entry was posted on Monday, June 21st, 2010 at 5:27 am and is filed under Features, UToday .